It’s been raining heavy since last night around eleven pm. Thunder, lightning, the whole bit. We had a great night of fantastic conversation and connected on music, even playing a few tunes and singing along. Just hanging out in my tent today reading a book, eating peanut butter,and resting. The rain started coming down just before 5am. I started dreaming about being inside my grandparents house while it rained and then I woke and realized it really was raining. I checked on the bike and all the gear. Everything seems good. So here I lay with my laundry drying above me until the rain slows. I’ll probably go into town today and pick up some more food in case I’m stuck here tomorrow too. 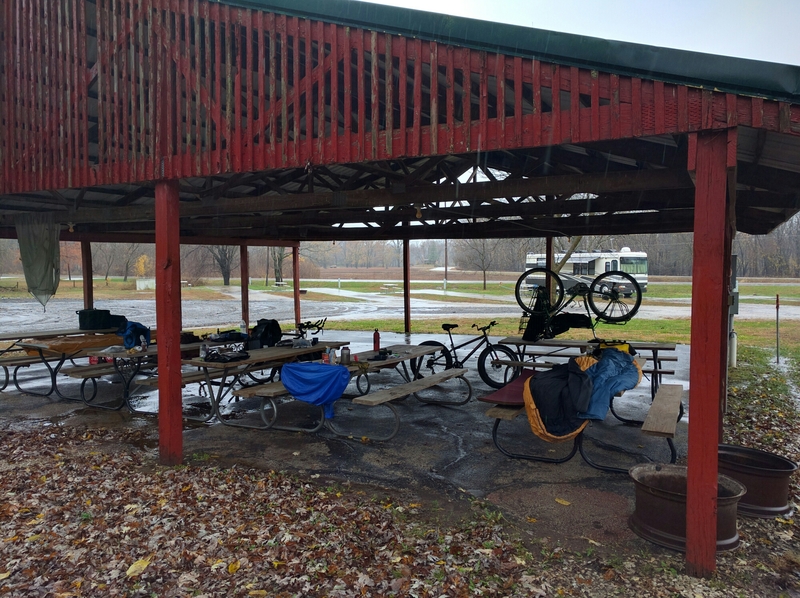 Wrapped up yesterday after thirty miles when I found a camp ground that lets cyclists stay for $5, has free WiFi, free showers, and reasonable laundry costs. 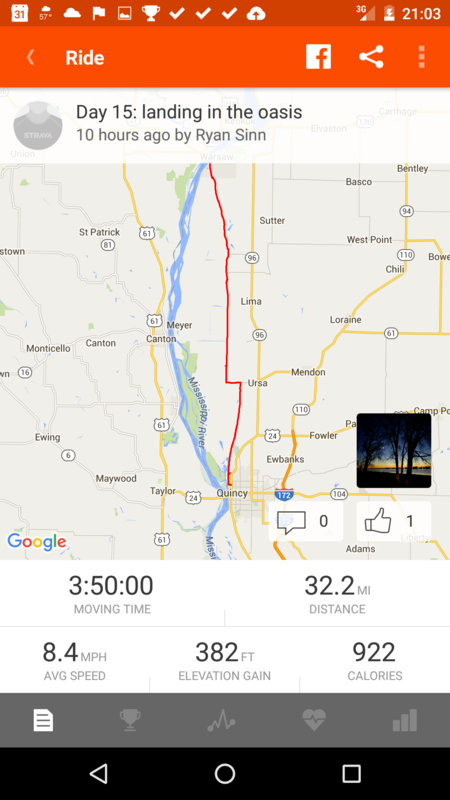 It was nice and sunny and seventy degrees, but the 15-25mph head winds made any real progress extremely difficult. The closest bar/grill had $1.25 beers and double cheeseburgers for $7.25. So I had a few and came back and showered and started my laundry. 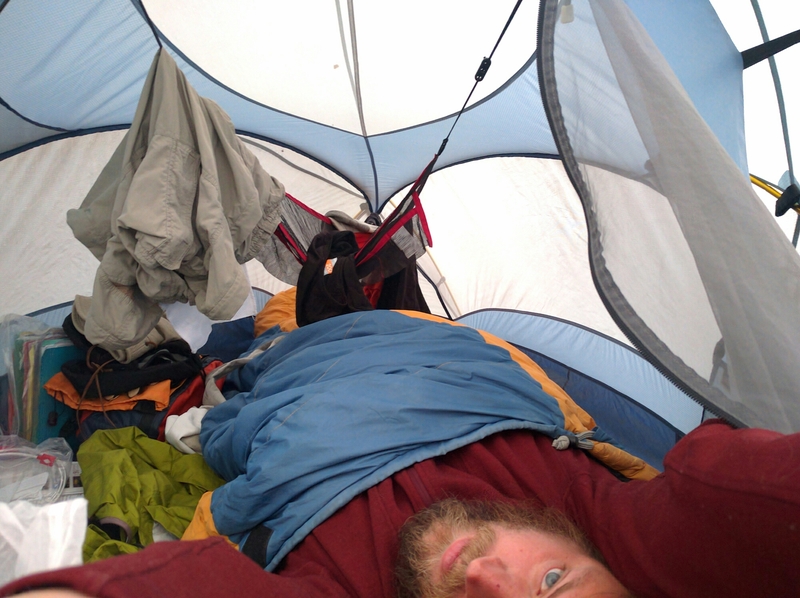 Expecting rain, I think I’ll be living in my tent the next few days. Ready to Roll Out after a photo opportunity. I awoke on the air mattress from nearly five hours of sleep. I took a shower and began loading everything onto my bike. Chris came downstairs and handed me a cup of coffee and we chatted while I ate half the cinnamon roll I’d left out from the night before. 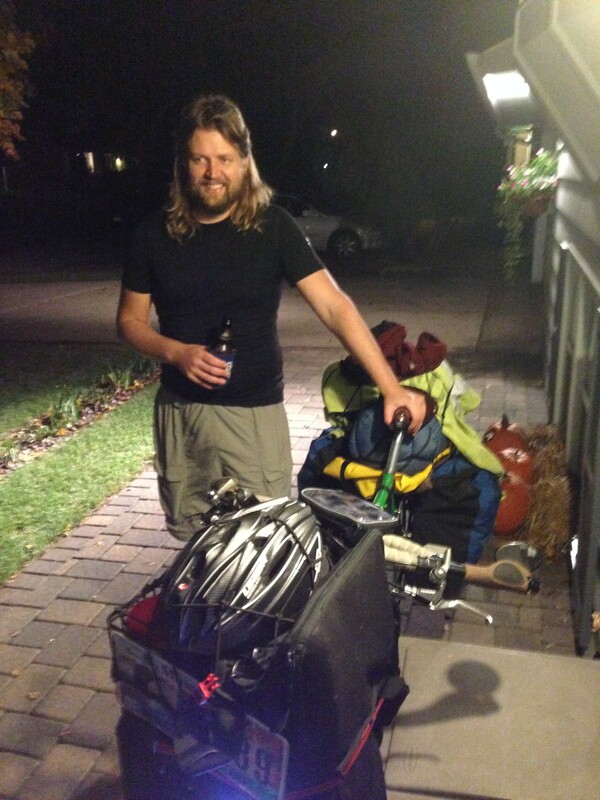 With everything repacked on the bike, I departed around 9:30 to begin the adventure. 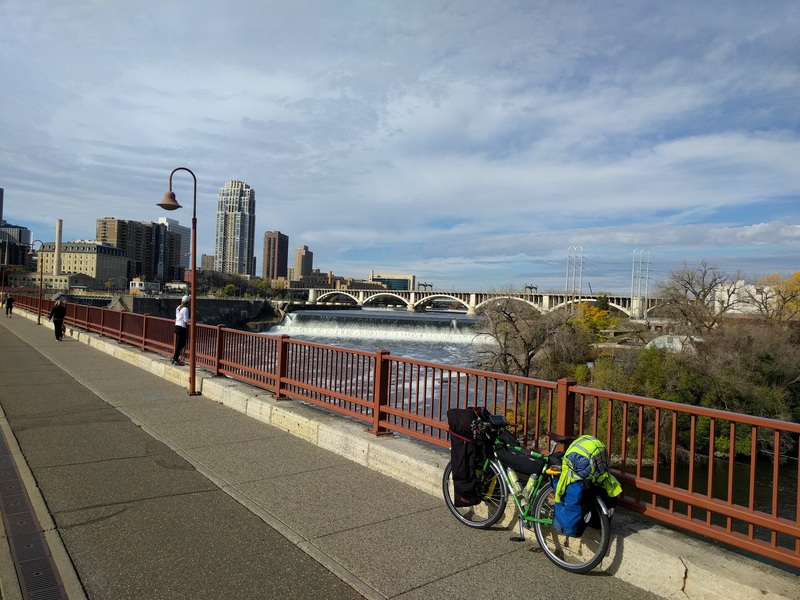 Heading into Minneapolis, I decided to take a familiar route down Central Avenue toward downtown. Autumn was in full swing and I stopped to capture some photos of the golden hue of the fallen leaves against the vibrant, green grass. 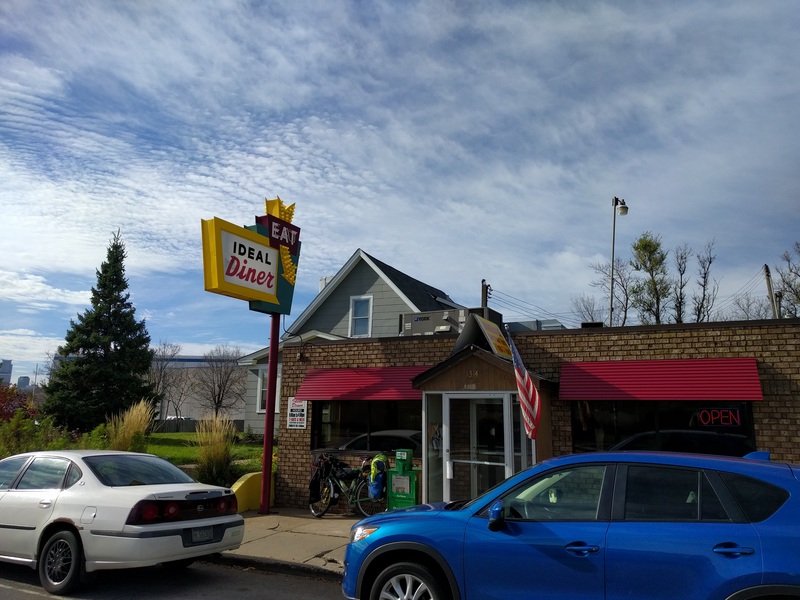 Rolling down Central Avenue, I came to Ideal Diner, one of my favorite greasy spoons and so I thought I’d stop in for a proper breakfast. An order of eggs, toast, and hash browns took 35 minutes to arrive, but they were still delicious. It doesn’t seem to matter when you cross the St. Anthony Falls pedestrian bridge, there are always people on it. 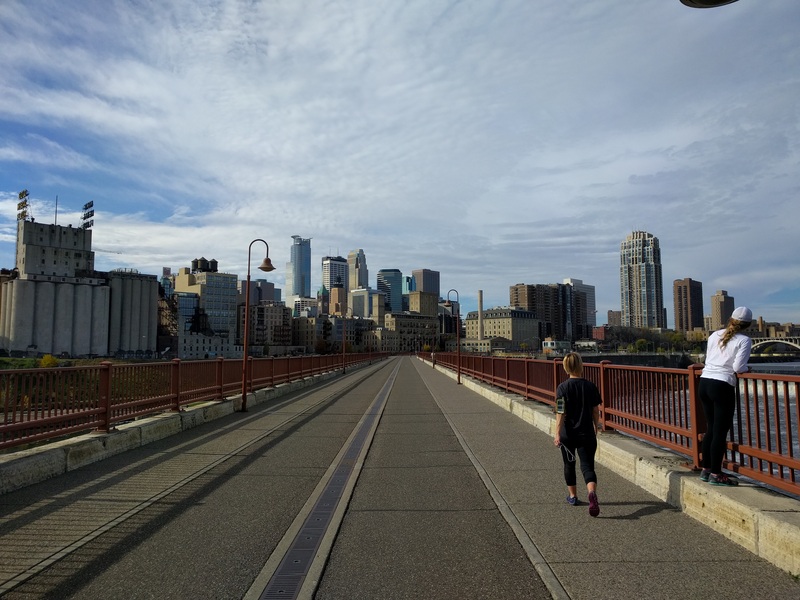 The Minneapolis Skyline from the St. Anthony Falls Bridge pedestrian and bicycle bridge. 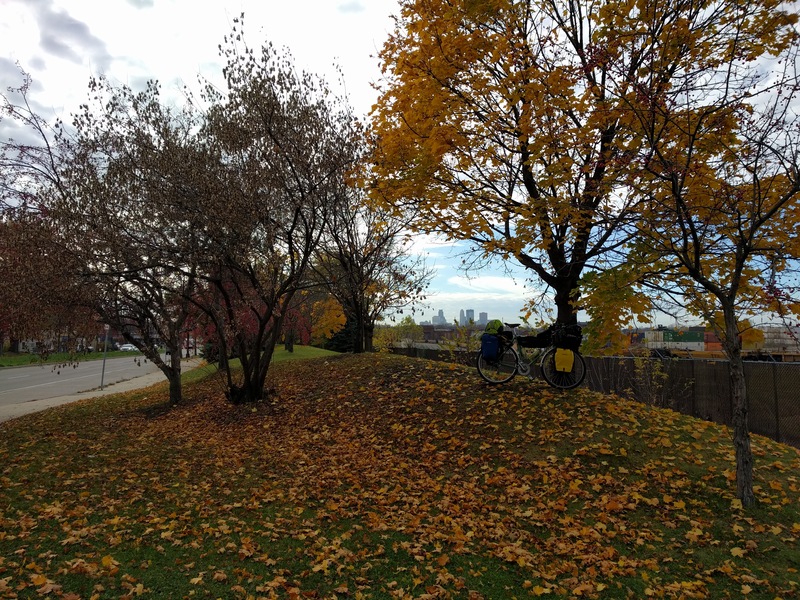 … and then onto the Midtown Greenway “bicycle highway” that cuts East<->West across Minneapolis. Continuing East, I passed one of the many pieces of public art along the trail. Overlooking Eastern Minneapolis from above Minnehaha Falls. They weren’t roaring or raging, so I didn’t bother to take a photo of the falls themselves. 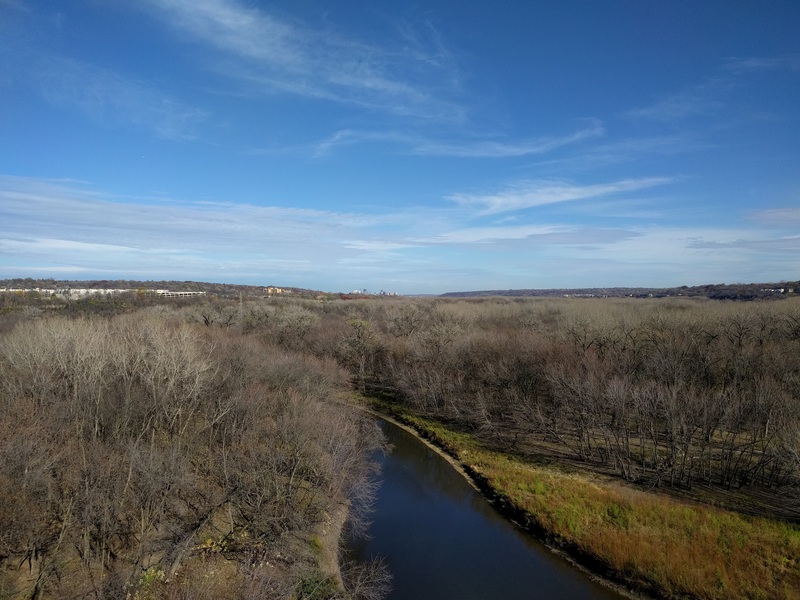 At Fort Snelling, I came across a military veteran who was picking himself up off the ground and cursing sporadically in every direction. I stopped and said hello, he asked if I’d seen him break the fence moments earlier while attempting to take a photo. I said, “no,” he them proceeded to express onto me his opinions about the government and how he’d wasted his entire day going out of his way to drive to the Twin Cities to meet with Veteran’s Affairs and receive a government issued cell phone. He was unsuccessful in receiving the phone. I wished him a good day and he did to me the same. 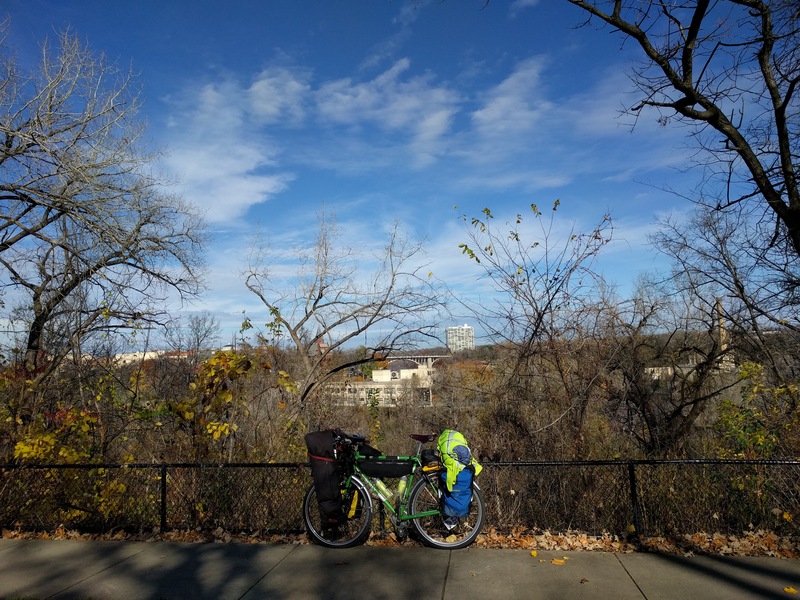 Full of energy and enthusiasm, I began the long slow climb over the Mendota Heights Bridge that crosses the Mississippi River. The St. Paul Skyline along the river. 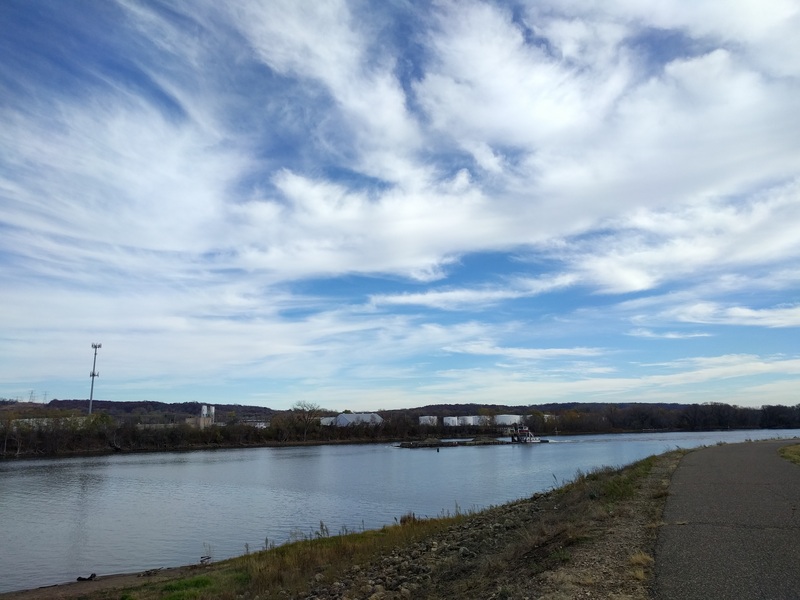 I continued to push out the miles along the river past Newport and toward Cottage Grove. A tug boat pushing barges up the river. 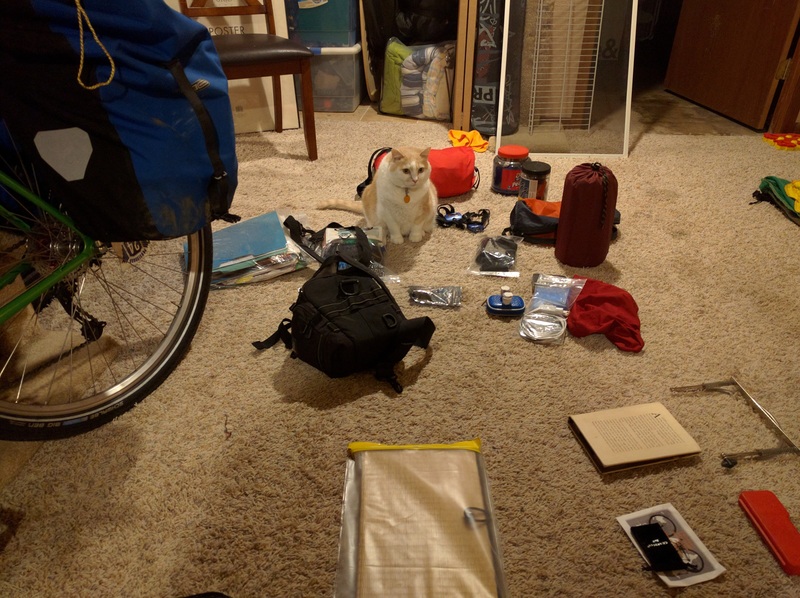 Did I really need my camera gear? nah. Did I really need a notebook? no. Did I really need four pairs of socks? … hmm, maybe. I pushed on and on and my host for the first night, Shawn, had foolishly offered me a ride if I needed one. So after climbing another hill and starting to see the sun set in the West, I sent Shawn a text saying I’d accept his offer. 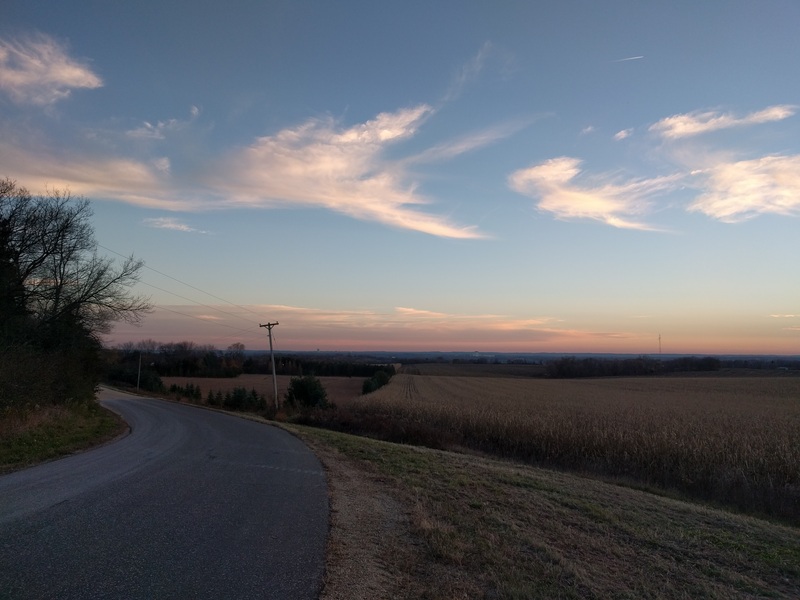 We were, after all, in daylight savings time and this “Mississippi Regional Trail” (MRT) I’d heard so much about wasn’t so much a trail as I was finding out, but rather riding the shoulder (when there was a shoulder) of 65 mile per hour (mph) traffic at 5pm on a weekday. No bueno. 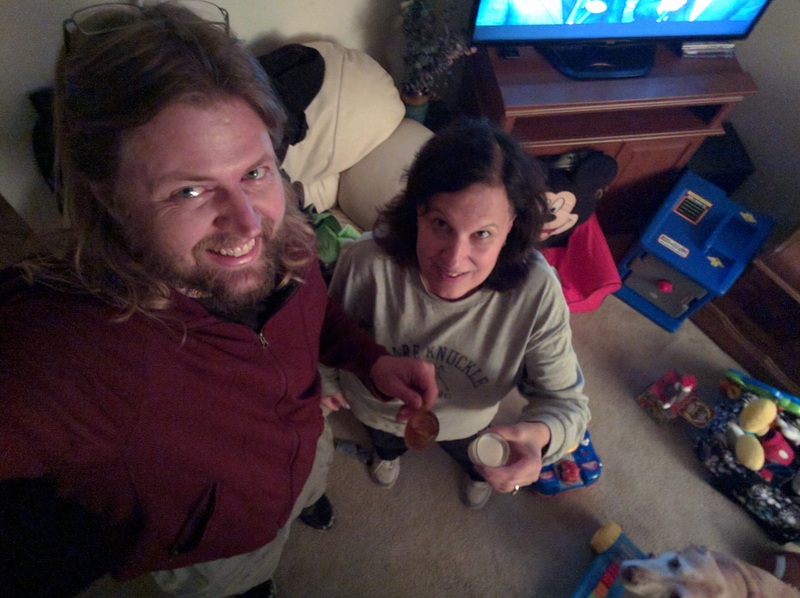 I pedaled into Prescott, Wisconsin, twenty miles from my goal for the day and I arranged for Shawn to meet me here in exchange, I’d buy him a drink. 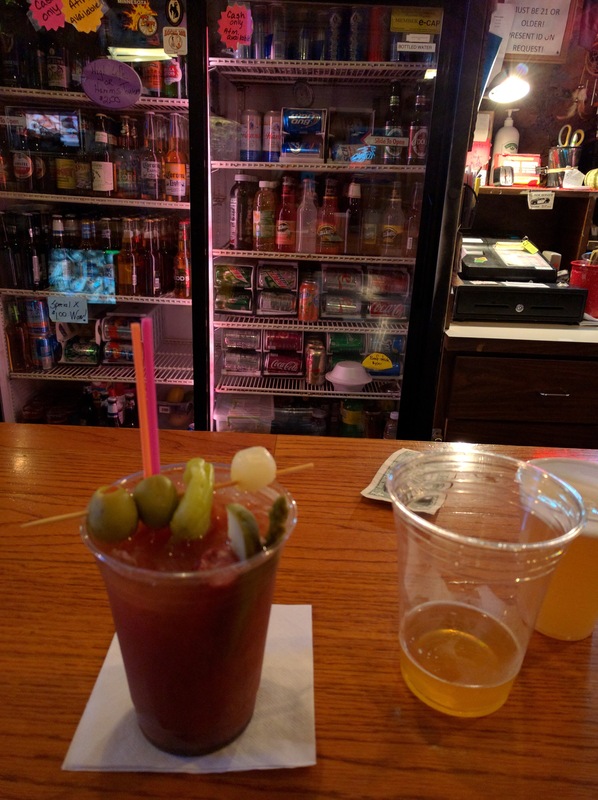 Shawn picked me up, we had a few, including a conventional Wisconsin Bloody Mary (re: the Happy Meal) and then we headed back to Shawn’s place, unloaded the bike, and proceeded to Andy’s bar/restaurant for about another 10 rounds and some wings for dinner. Packing and planning is such an exhausting part of the process. In the packing and planning stage, I suffer bouts of self-sabotage where the anxiety and fear of the unknown take over the rational part of your brain. Do I need a pair of gloves in case the weather turns cold? yes! This leaves you with a pile of gear that looks more like you’re packing a dog sled then a bicycle. At which point I attempt to pack it all onto the bicycle. There goes another few hours to figure out how to fit everything and then finally attempting to lift the bike (difficult!) and then riding the bicycle around a bit to realize how ridiculous my concept of essentials really was. I carry about 10 pounds worth of tools and repair parts on the bike and even though it would feel good to have used the tools to repair something on the road, I hope I never need to dig them out of the bags. The bike loaded down with only the essentials. The first and maybe also the final part of my planning is route planning. I’ve done enough small tours around Minnesota to know that the only thing you can really plan for is where you’re going to stop – not what’s going to happen in-between. 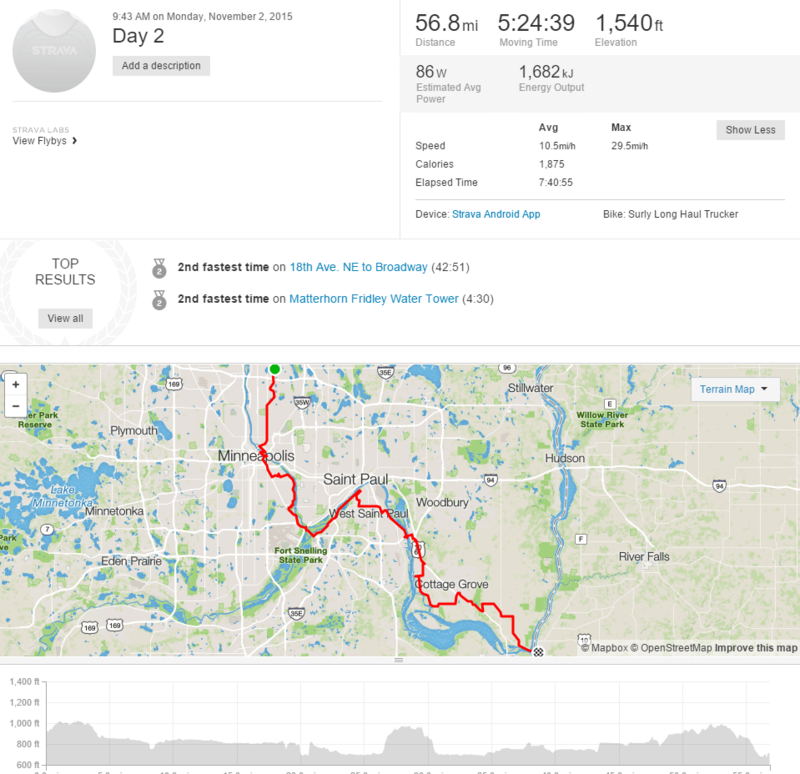 I guesstimate that I’ll do about 60-80 miles per day on average, figure out how many days I have, and then find a place in the mileage range that is my end point. 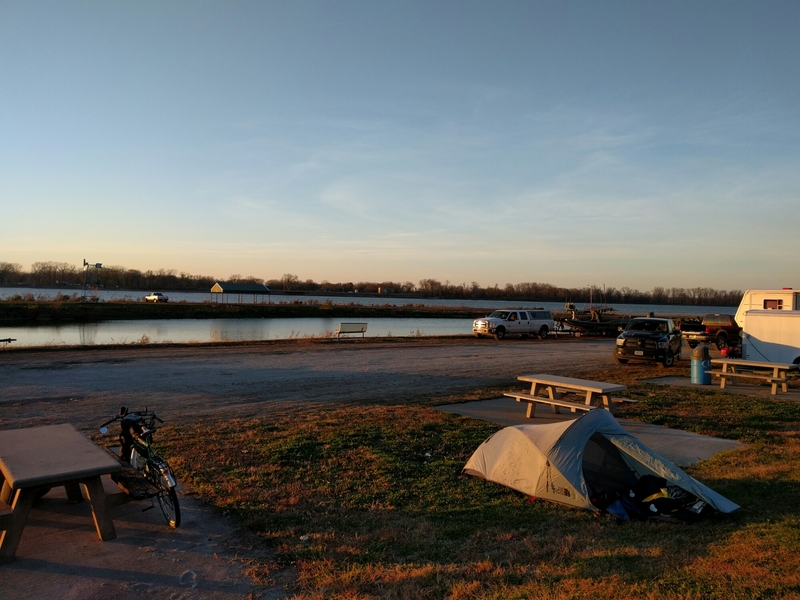 I like to figure out my daily stopping points the day or two days prior, but not much before that, because life on the road is unpredictable… Expectations only lead to attempting to control things that you can’t like the wind, flats (kinda,) and traffic. Mitigation is a possibly with pro-active bike maintenance, being aware of the world around you (no headphones!,) eating frequently (stop the hangry,) and not running over pointy things in front of you. Ultimately when I make plans I find myself rushed and frustrated, so hence, I make one day goals. Living in the now, because the now is really what I need to deal with. I acknowledge tomorrow and next week and the week after, but my world operates one pedal crank at a time. If I want to climb a hill faster or reach a stopping point sooner, my only option is to pedal faster and harder. The flip side is I’m not obligated to climb that hill or reach that destination, so I can stop any time I’d like. 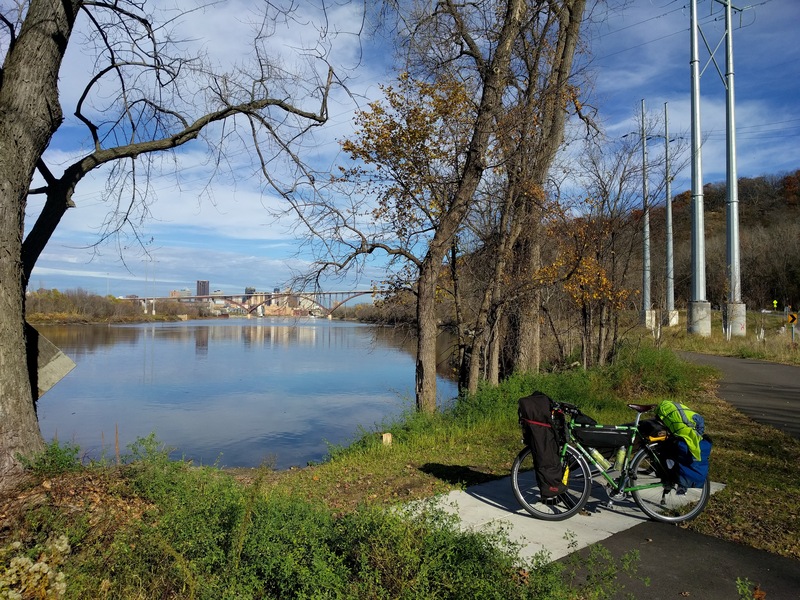 To me, the trip becomes much more enjoyable when I don’t have much for plans outside of the final stopping point of the immediate trip and miles and miles to think about plans in my head to decide how to proceed with determining the next waypoint on the trip. There’s always plenty of excitement along the way to keep things interesting. The finished product with me freshly showered! I would like to use a different font.